Properties in Church of Viseu average 4.6 out of 5 stars. Casa d'Aldeia - Special meeting place for family and friends. 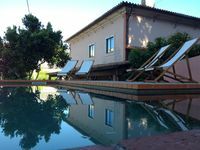 Property 13: Casa d'Aldeia - Special meeting place for family and friends. Property 26: Memories of the Serra - House in the village, in the middle of the Sierra between granites and vegetation. We had a very nice stay in the house in Luso. Our extended family of 8 found everything that we needed and very much enjoyed our stay. The town, Luso, it a bit off of the beaten track and if we wanted to see nearby towns (like Cumbria) it was a bit of a travel (about 30-40 minutes), but the house was great for a laid back holiday where sightseeing was secondary.